Lighting and heat are too intense and unflattering for the most of the day. However, there are two sweet spots for photography, better known as the golden hours which happen right next to sunrise and sunset. For logistical and logical- reasons, most often I photograph sunset sessions, but, every once in a while I wake up early to do a sunrise session. Gina and Rafael were hopping on a cruise ship later in the day, so morning time was their only option. 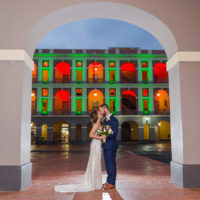 It was so amazing to see Old San Juan in -literally- a different light and without passersby. It felt like we had the old town to ourselves, which led to many beautiful, intimate photos. It was a beautiful morning, and I hope I get to capture more sessions like this.